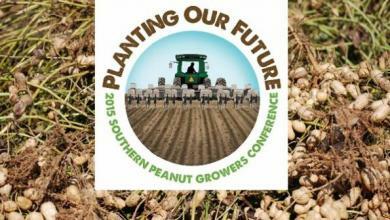 Mark your calendars for the 17th annual Southern Peanut Growers Conference July 23-25 at Callaway Gardens in Pine Mountain, Ga. This year's conference “Planting Our Future” offers farmers an opportunity to learn more about legislative issues, market growth and production issues. The keynote speaker this year is Krysta Harden, Deputy Secretary of Agriculture. The registration deadline is June 30. The registration fee increases by $50 July 1. This will be the first year the conference has been held at Callaway Gardens. There are a number of activities for families at Callaway Gardens ranging from relaxation to recreation. Callaway Gardens offers an award winning spa, numerous beautiful gardens to explore and the Cecil B. Day Butterfly Center, which is one of North America's largest conservatories. Check out the Birds of Prey show, Florida State University's Flying High Circus or Robin Lake Beach where the entire family can enjoy shuffleboard, mini golf, paddle boats, water skiing and more. Callaway Gardens also offers two 18-hole championship golf courses, tennis courts, bicycle and nature walking trails, as well as the tree-top adventure zip-lining course.